You know that old mantra "Don't like, don't play?" Yyyeah... Ron doesn't have that option. Ron, you see, is a game critic who's had the misfortune to get sucked into his least favorite type of game: a point-and-click adventure game by Interactales. Now there's only one thing left for him to do: Escape THE GAME! But even if Ron doesn't like point-and-click games, developer Interactales does, as they've crafted an adventure that's stuffed to the gills with references to genre classics, as well as many gentle jabs at the genre conventions. But Escape THE GAME is more than just parody! It's also a clever adventure game in its own right, as it offers puzzles with multiple solutions, three different endings, and even the proverbial barrelful of laughs. And you don't even have to be well-versed in classic adventure games to find them... plenty of the humor here is universal! Escape THE GAME is a point-and-click game to its core. You'll be talking to people, picking up everything that isn't nailed down, and rubbing items on other items in search of the combinations that allow you to progress. Everything here will be comfortably familiar to point-and-click fans, even if Ron himself isn't impressed. The initial draw here lies in the situations Ron finds himself in, and the dialogue... just about every other line lampoons some classic adventure game trope, from giving your hero ridiculous names to the insane things adventure game heroes somehow end up carrying around in their pockets. There's also plenty of lawyer-friendly cameos of classic adventure-gaming icons like Guybrush (sorry, "Duedraw") Threepwood and Sam and Max. But Escape THE GAME also provides some excellent puzzle scenarios by giving you more than one way to solve almost every problem you come across. Sure, you could collect all the ingredients you need to make a magic potion so that a wizard will consider you one of his own, but you might be able to use those ingredients in other ways, and maybe someone else will recognize you as a wizard on the sly. You CAN beat the legendary hero in a mighty one-on-one duel, but there could also be a way to get him to drop out of the fight. Despite the multiple ways to press forward, however, the game can still sometimes be obscure about what to do, and it requires you to solve certain puzzles in very specific and exacting ways. While the game does have a character who is very open about his role as designated hint-dropper, he'll only tell you about one possible solution. But while the puzzles can be fiddly, the humor's almost always spot-on. Escape THE GAME's blend of jokes, references, and smarts is a winning combo... even if the snooty Ron won't admit it. Escape THE GAME Walkthrough now available! These quests will not affect the outcome of the game. To solve the riddle the guards gave you, you’ll need to see for yourself what happens when a troll falls in the forest. Go to the “Pirate’s Bay”. Talk to the monkey and ask it for a banana. Eat the banana by double clicking on it. Go to the forest and use the banana peel on the non-deaf troll. Observe what happens and go tell the guards at the city’s entrance. Once you’ve entered the city, take the gloves from the blacksmith (he won’t mind). Next, go to the hero and challenge him to drink all his beer in one go. When he’s done, he’ll ask you to order another one for him from the tavern. Tell this to the bartender in the tavern and head out. The hero will come to grab his beer and while he’s gone you can take his oil. Now you can easily get the sword out by using the oil and then the gloves on it. Don’t forget to take the princess with you. follow the owl, follow the squirrel, follow the owl again and lastly, don’t follow any of them. Inside the city you’ll find a drunkard outside the tavern. Simply talk to him until he gives you the Decompiler. How you complete these quests will affect the outcome of the game. To get “Ending 1”, you’ll need to complete ALL the quests using Method 1. Completing any (or all) of the quests using Method 2 will result in “Ending 2”. Go to the Pirate’s bay and then to the pirate ship. Talk to the captain and ask him how you can become a pirate. Grab the fake statue he gives you and head into the city. Go inside the tavern and take the ticked from one of the tables. Head to the philosophers’ party to the right. Give the ticket to the man outside so he’d let you in. Go to the second floor and use the fake statue on the real one. Lastly, go back and give the real statue to the pirate captain and you’re done. Go to the Pirate’s Bay and challenge the ship’s captain to a duel. Once you’ve won, grab the piece of the pirate’s clothing from the ground and go back to the city. Give the piece of clothing to the sheriff (the dog) and the pirate will be arrested. Go into his ship and steal the pirate hat. Once you’ve gotten the Decompiler from the drunkard, go back to the hero and use it on him. Choose the option that says “If hero hit three times then hero use magic”. This way he won’t be able to heal himself and you can easily win the duel. Once you have the dwarf’s tears and the princess, challenge the hero to drink all the beer in one go. When he asks you to take one for him from the tavern go inside and tell this to the bartender. Give the princess to the two drunks at the bar so that everyone would be distracted. Put the dwarf’s tears in the beer and challenge the hero to drink it again. Grab his medal from the ground and you’ll be a true hero. Talk to the wizard who’s making a potion and ask him how you can become a wizard. He’ll give you a list of things you’ll need to gather. Grab the empty jar from the ground and head back to the city. Talk to the crazy goblin and he’ll tell you that he can duplicate an item for you. The correct item would be the empty jar. Head to the Philosophers’ party. Use one of the empty jars on them and the boredom will make the main character yawn in it. Go inside the tavern and use the Decompiler on the giant bug. Select the option which weakens it while it’s resting and stab it with your sword. Once you’ve taken the sword out of the rock, the dwarf will feel ashamed and start crying. Simply use the empty jar on him to collect his tears. 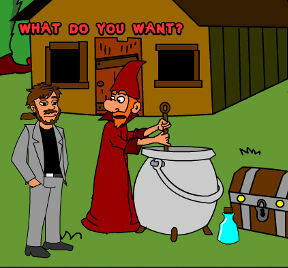 Bring the three items to the wizard and he’ll give you a magic wand. You’re now a wizard. Talk to the wizard who’s digging a hole. He’ll tell that he’ll give you a wand if you find a way out of the game. Go to the city. In the area right of the tavern, you’ll find a bucket of red paint. Take it and head back to the beginning, where the ancient tree was. Use the red paint on the invisible door. Now that the door is accessible, go and tell the wizard about it and he’ll reward you with a wand. Become a Pirate, a Hero and a Wizard the “honest” way. In other words, steal the statue for the pirate captain, defeat the hero in a duel and gather all three items for the wizard. Once you’ve done ALL of these, head to the rightmost part of the city. Show all the items to the guards as proof and they’ll let you in for the final dialogue with the king. Become a Pirate, a Hero OR a Wizard the “dishonest” way. You could do this by getting the pirate captain arrested, making the hero pass out or getting the magic wand from the wizard who’s trying to get out of the game. Whether you only do one of those or all, the ending will be the same. Once you’ve got all three items, head to the throne room in the rightmost part of the city and show them to the guards. Obtain the wand from the wizard who’s trying to get out of the game by showing him the door at the starting area. Once you have all the items the guards required, the wizard will come to you and ask you to go with him. To get the 3rd ending you’ll have to do whatever it is he’ll be doing. which you need for endings 1 and 3. This was downright delightful, though. haha I'll be honest. At first I wasn't impressed by the humor and style at all. But as I played some jokes really made me crack up and the game became very engaging. do not solve the hedge maze even though you are required to enter it and have to travel through it (where the animals on the sign are very obvious and enticing to a second successful following for point-and-click vets who can guess what's needed for that type of puzzle easily) to make the progress the game is expecting. Reaching the wizards is assumed to be something you'd only do long after getting into the castle (as is probably pursuing the Guybrush Threepwood ripoff) instead of one of the first things because I guess it wasn't designed with vets that go after puzzles of least resistance in mind and other $REASONs. In addition to referring to the Discworld point-and-click games, he quotes one of my favourite lines from Sourcery! RIP, Sir Terry. Since a long time ago I can't play any games hosted in JIG from my Ubuntu machine. It is not possible to blame the same old culprits here. I have ABP disabled for the whole domain and it is not a flash plugin incompatibility. This is made evident by the glaring fact that I can play the same games mostly everywhere else, where I have no problem whatsoever. This game looks like a JIG exclusive, since I can't find it anywhere else, so that means the proverbial Linux 1% (if that) is just SOL on this one. Ah, well, on to another game. OK, I found it at another site, not an exclusive and it's all good, then, huzzah! cu: Don't blame Jayisgames for this. I've never had a problem with the site on Mac OS or Ubuntu. Perhaps your site-specific Flash Player settings are messed up.